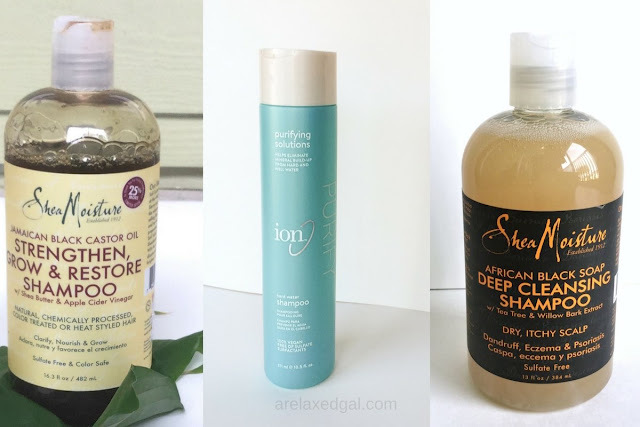 Every once in a while my hair and scalp feel dirty, full of product and weighed down or they may feel really dry. Whenever they feel any of those ways I have a hard time styling my hair including making it hold a curl for any length of time. And my scalp itches and flakes a lot and may even smell. When that happens I know it's time to clarify. 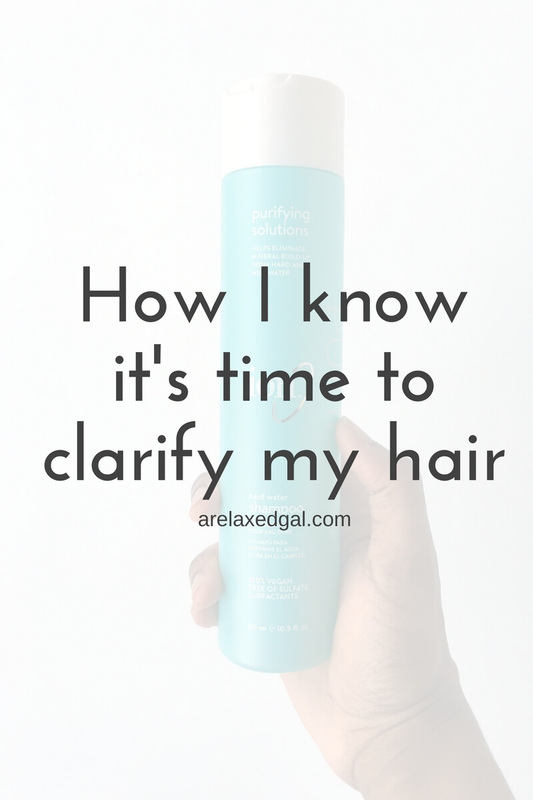 Don't get me wrong, I cleanse my hair and scalp once a week, sometimes twice a week, but I don't always clarify. 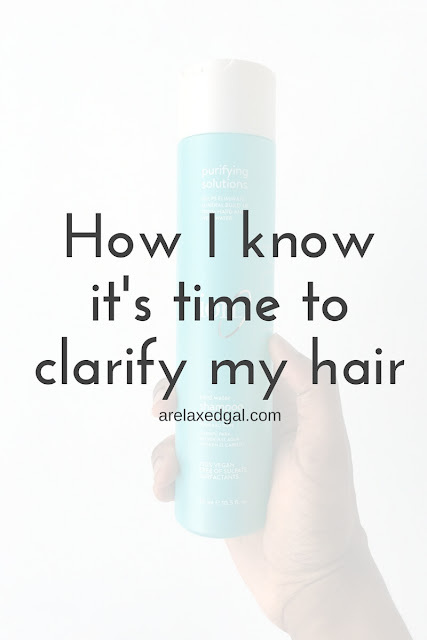 When I clarify my hair and scalp I'm giving them a fresh start because a clarifying shampoo removes dirt and product build-up from my scalp and hair strands better than a regular shampoo. Depending on the formula a clarifying shampoo can also remove product build-up and mineral deposits from hard water and swimming pool chlorine. After I clarify my scalp and hair they always feel so much better. My hair tends to be more manageable, holds moisture longer, looks better and is easier to style. My scalp itches less, isn't dry and it just feels cleaner. Additionally, it promotes healthier hair growth and even length retention. There are times when I work out on a regular basis and when I work out I sweat. This can give me a really sweaty scalp and when my scalp gets really sweaty it feels awful and dirty. When that happens nothing other than a good deep cleansing helps. While I don't need to clarify my hair every single week I do need to do it every once in a while. Especially when I co-wash several weeks in a row. This allows me to give my hair a fresh start. This could be spending time at the beach whether I got in the ocean or not. The wind, sun, and sand can do a number on my hair. If I go for a dip in the pool I have to clarify my hair so I can remove all the chlorine. This happens when I use a lot of product on my hair between washes. Such as moisturizing and sealing daily with heavy creams and oils. I also tend to find I get product buildup when I co-wash several weeks in a row. Sometimes my dry hair or scalp issues aren't from lack of moisture, but my hair follicles being clogged or from product buildup. SheaMoisture African Black Soap Deep Cleansing Shampoo. I like this shampoo because it's sulfate free and is also formulated to help with scalp issues. SheaMoisture Jamaican Black Castor Oil Strengthen, Grow and Restore Shampoo. This shampoo is also sulfate free. and doesn't dry out my hair. Ion Hard Water Shampoo . This is a shampoo with sulfates, but it helps remove mineral build-up from hard and well water. Additionally, I try to rinse my scalp with diluted apple cider vinegar when I co-wash as it's a natural way to clarify. I have never tried the products you mentioned and tend to stick to ORS creamy aloe shampoo.